I don't really listen to a lot of rap, which makes it hard for me to write credibly about it, I think- but the whole purpose of this mess of a project of mine was to listen to the albums that I dig and there is a flavor of underground/indie/non-mainstream rap that I really, really dig. Folks like Hieroglyphics and Atmosphere- and yes, Aesop Rock. I'm pretty sure I remember reading a review of None Shall Pass in EW which really dug the track, 'The Harbor Is Yours' so I listened to it, thought it was amazing and immediately downloaded it. I think it provides the perfect snapshot into why I like this album. The lyrics are dense, intelligent and literate and that's awesome. 'The Harbor Is Yours' tells a complete story, start to finish in just under four minutes and it more than just captures your attention- it entertains you as well. And it rhymes! The hooks and lyrics get into your brain and that to me in probably the secret to success in rap and hip/hop... if you can tell me a story, entertain me and turn a phrase that's going to stick in my head for days and weeks after the fact, then you're doing it right. ("Gathered himself she was ghost he down the rope ladder/to deck circled the vessel 360 swiftly/found nothing in the water but salt, piss and whiskey," Is a particular potent example of this, I think. The density of the lyrics here is pretty much universal across the album- if you're still mad that Pluto lost it's status as a planet, then check out 'Bring Back Pluto' ("This is a corpus full of pills, trying tosit still and build/Cause eight planets bullied number nine until he fell.") It's also worth noting that your lyrics have to be dense where there's annotations in the azlyrics.com page asking for someone else to finish them out. But while those two tracks highlight the lyrical talents on the album- and this is where I'm sure I'm going to sound like an idiot- but there's good musicality to this album as well. (Is that even the right word? Help me, I'm not a music journalist!) 'Catacomb Kids' is the highlight in that regard. The hooks/beats, whatever the technical term is just work really, really well- especially the refrain. ("I'm an activator/Made a fire, made a wheel, made a snack for later/Catacomb kids cuddle up and test the flavor.") '39 Thieves' is another track that stuck in my brain for exactly the same reason- it tells a story, the rhythm works and it's generally awesome. This whole album is awesome. It's the sort of mellow, low groovy sound that I like in indie/underground rap and the density and complexity of the lyrics are probably the best I've come across so far in my admittedly limited experience of the genre. Like with country music, I don't like all rap, but when I find something I like, I like it a lot and Aesop Rock fits that definition to a 'T'. 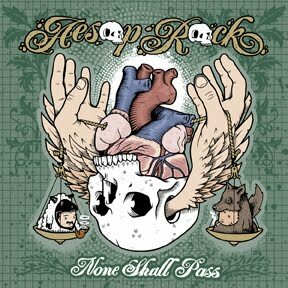 Overall: If you like rap music that's a little off beat, with crazy awesome complex lyrics that tell incredibly stories while entertaining the snot out of you, then Aesop Rock and this album are worth checking out. Honestly, I'm a little bummed I missed out on going down to the Blue Moose to see him in person when he came through Iowa City last month- but I will say **** out of **** and I would for sure listen to more of his albums on Spotify again.